Unless one were lost in the woods these last couple of weeks, it would be impossible to miss the uproar over the George Washington Bridge closures. Last September 9-13, lanes were closed on the Fort Lee side of the bridge, which is the busiest bridge connecting New Jersey to Manhattan, in a sudden and unexplained move, later brushed aside by port authority officials as a “traffic study”. On Dec. 16, 2013, John D. Rockefeller IV, chairman of the Senate Committee on Commerce, Science and Transportation, wrote to the chairman and vice chairman of the Port Authority of New York and New Jersey requesting answers to very direct questions regarding the lane closures. Answers were provided in a letter written by the Port Authority Board Secretary which were filled with standard protocol type language. It was not until a subpoena from state legislators demanded emails and text messages from various people involved with the closures, specifically Bill Baroni and David Wildstein, that it became evident that the lane closings were political retribution against the mayor of Fort Lee, a man of Croat heritage mistakenly referred to as a Serb in one of the emails, perhaps the biggest insult of all. The people who instigated the lane closures were all close allies and working for Governor Chris Christie of New Jersey. While the governor has claimed he knew nothing of the involvement of his team in the closure of the lanes, he has a reputation of being a bully, and taking retribution on a political foe is consistent with his character. He is known for his bullish, bullying style, making fun or yelling at opponents who have the temerity to speak against him. It was time for the television pundits and posturers to take a stand, generally, as one would guess, along political lines. There was one comment that really stood out, though, as being a strange, and utterly outdated way to see this debacle for Governor Christie. After all, he is positioning himself to be the spokesperson for the republican party, and possibly to run for president in 2016. He should be preparing the big tent, to attract conservatives and near-conservatives, libertarians and tea-partiers, whites and off-whites, men and, yes, even……women. Brit Hume, senior political analyst at Fox News, on a Sunday talk show called “Media Buzz”, had this to say: “Well, I would have to say that in this sort of feminized atmosphere in which we exist today, guys who are masculine and muscular like that in their private conduct, kind of old-fashioned tough guys, run some risk.” He went on to explain that the governor is an old-fashioned guy’s guy, a masculine and muscular guy, in constant danger of looking thuggish or sexist. He got a quizzical look from a co-commentator on the program, Lauren Ashburn, but later was supported in his contention by another Fox star, Bill O’Reilly, who said that real men who are rough around the edges, maybe rude or blunt, get a raw deal from the public. Another way to look at this, though, is that real men, manly men, have a right to their own way of behaving, and women are trying, and now succeeding in ruining it for them. Has running “suffered” from feminization? The Olympic Marathon of 1896, held during the first modern day Olympics in Athens, Greece was a men-only event, as were all the events at that time. Initially, women were probably not considered for competition, since they were not felt physically capable of participating. They were also excluded based on a men’s club mentality. But, a woman did run the first Olympic marathon, just not as an official competitor. Her name was Stamata Rivithi, and she completed the 40 kilometer course in 5 hours and 30 minutes. The winner that year, a Greek named Spyridon Louis won the men’s event in 2:58:50. Violet Percy, an English woman, was the first officially timed woman marathon winner with a time of 3:40:22 at the Polytechnic Marathon in London in 1926. These women broke barriers, but the premier marathon event, the Boston Marathon, had yet to be tainted by the presence of women. It was not until 1966 that a woman named Bobbi Gibb (co-alumnus(a) of mine from Revelle College, UCSD), ran the Boston Marathon as a non-registered runner. It being an AAU sanctioned male event, women were not permitted to officially run it. Bobbi Gibb’s story is nicely told in an interview she did which is posted on the Bill Rodgers Running Center website. She reports she applied for an entry to the race, but got a reply from the race director, Will Cloney, stating that women were not physiologically able to run a marathon, and furthermore, were not allowed to. She had to hide in the bushes at the start, wearing her brother’s shorts and a hooded sweatshirt. She joined the race after about a third of the runners had started. She reports that she was recognized as female, as she put it, by the men studying her anatomy from the rear. The men around her were very supportive. She says they told her they would not allow anyone to remove her from the race. She finished with a very respectable time of 3:21:40. While unofficial at the time, she has since been recognized by the Boston Athletic Association as the first female winner, and she won three years in a row. Ironically, at the time she ran her first Boston, the longest sanctioned race for women on the AAU calendar was 1.5 miles. In one of our major races in the Philadelphia area, the 10 mile Broad Street Run, held the first Sunday in May, the number of women participating has grown steadily since the race began in 1980. This past year, 2013, the total number of women finishers was 17,269. There were 14,773 male finishers. 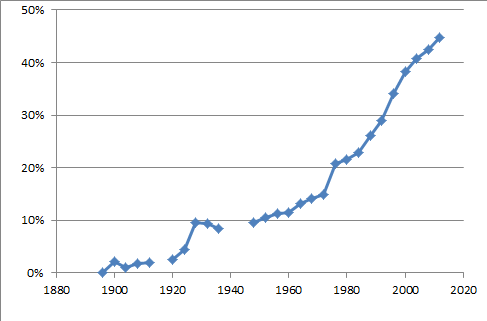 For major marathons, women have not yet reached parity with the men, but are not far behind. For 2013, at Chicago, there were 17,395 women and 21,488 men finishers. For New York, 19,567 women and 30,699 men completed the race. In Europe, at the Berlin Marathon, 8,946 women and 27,528 men finished. And in Los Angeles, 7,773 women and 11,761 men crossed the finish line. In Boston in 2012, 9,006 women and 12,666 men got to run that last stretch down Boyleston Street to the iconic finishing banner. Women have also become leaders in the world of running organizations. Mary Wittenberg, the president and CEO of the New York Road Runners, is responsible for the business and operations of the club, including the production of the New York City Marathon. 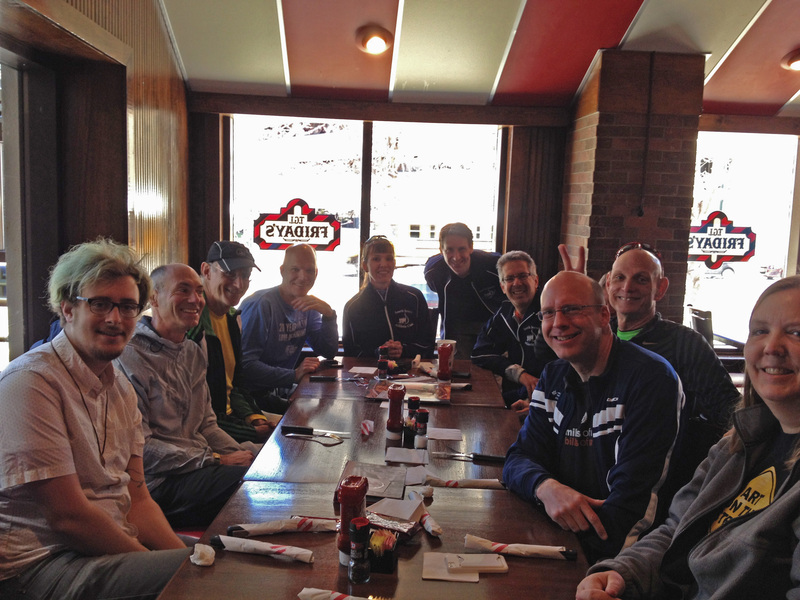 Stephanie Hightower is president of the USATF, the national governing body for track and field, long distance running, and race walking in the U.S.
Every Sunday morning, I meet with a group from my running club at 7:30, to run a 13 mile loop. Sometimes we go farther, if we are in the midst of training for an upcoming marathon. 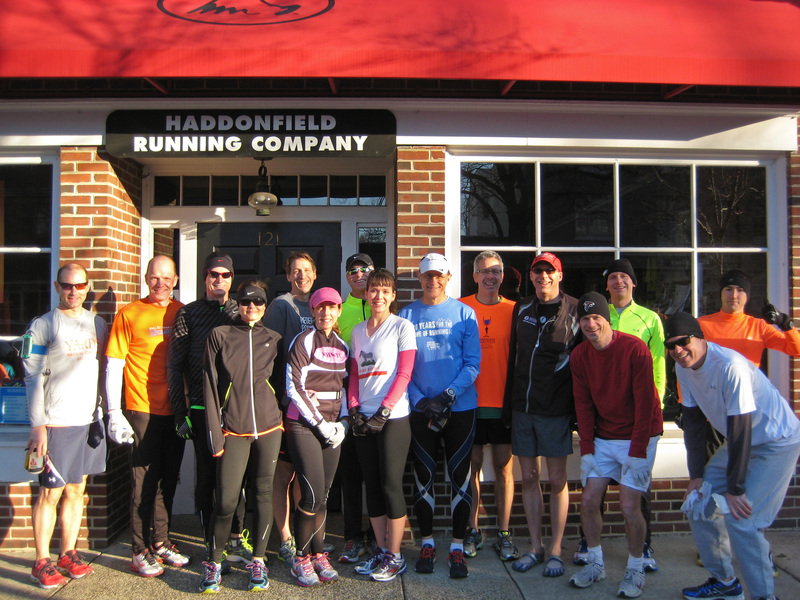 We’ll start out earlier, get the extra miles in, and then meet the group at 7:30 to start together. We have a balance of men and women in the group. I’m sure not one of the guys feels put upon, inhibited or less manly because women are participating in the sport. Likewise, the thought that women are not capable of participating, the thought held 30 years ago and earlier, has been proven to be bunk. It is true, that when men and women mix together in a social setting, men behave more civilly, less crudely. At least, they should. There really is no excuse, in my mind, for bullying and being obnoxious, and it certainly is not the fault of women if someone who behaves that way is brought down. I would say, yes, running has been feminized, in that women have been able to participate in this great sport which was once closed to them. 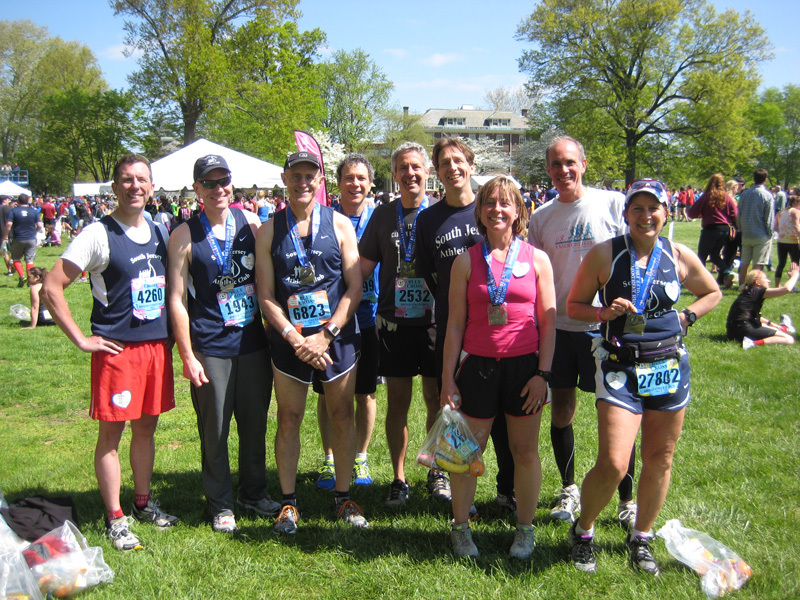 They have shown their mettle, and taken on the challenges of the toughest of races, the marathon. They have contributed greatly to the organization and running of the sport, and their participation keeps growing. Far from making us guys unmanly, less of a man’s man, they have joined our ranks, and made it better. What a bunch of “bushwa” (got that from a NYTimes crossword puzzle) coming from Brit Hume and Bill O’Reilly. We had to get up awfully early. The start of the race was scheduled to be at seven AM, and the officials were recommending runners arrive by five AM to get through security. That would mean a lot of time standing around waiting to start, in the dark, getting cold. After Boston, it seems all of the US based marathons, and perhaps worldwide, I don’t know, have gone to higher levels of security around the start and finish of the races. It seems a false sense of security, but I understand the motivation. 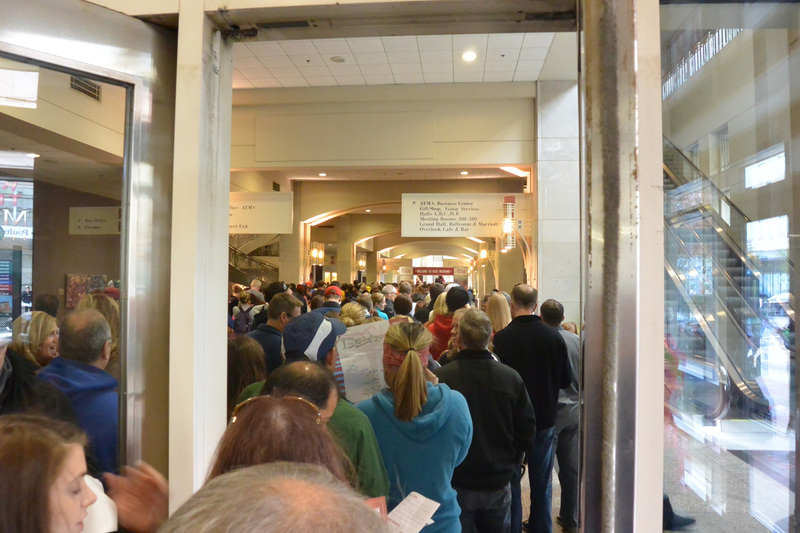 In Philly, we were told there would be security entrances at the staging area of the race and we should expect lines. Hence, the reason for early arrival. We compromised, with a knowledge that this being our hometown race, we could predict how things would go. I set my alarm for 4:00. I wanted to get a decent breakfast before heading out. I ate a bowl of cereal and had a cup of freshly brewed coffee. I bought the beans the day before at Old City Coffee at the Reading Terminal Market. It has become my tradition, to go to the marathon expo at the Philadelphia Convention Center, pick up my number, browse the expo, then head over to Reading Terminal Market across the street. I even know the route I will take through the market. First, a stop at Metropolitan bakery, for a pain au levain and a loaf of cherry chocolate bread, because life is better with cherry chocolate bread. Then I head to Downtown Cheese, to pick up something tasty, usually a goat gouda or morbier. Then, it’s on to Old City Coffee for some of their freshly roasted beans. At Old City Coffee I had a conversation with a young woman also buying coffee. She asked if I was running tomorrow. “Yes, the full,” I said, smiling. She looked plenty young and fit enough to run an ultra if she wanted, and I felt a bit wistful, that someone could be perfectly satisfied running the half, knowing others would be running the full, and thinking she had done the right thing. While waiting for our coffee, we talked about the course, how the crowds gather on Chestnut street, how the weather would be, and how early we had to show up the next day. I then said “have fun tomorrow”, and headed back to meet my friends who had come to the expo with me, and were patiently waiting, actually having lunch, while I indulged my wants. 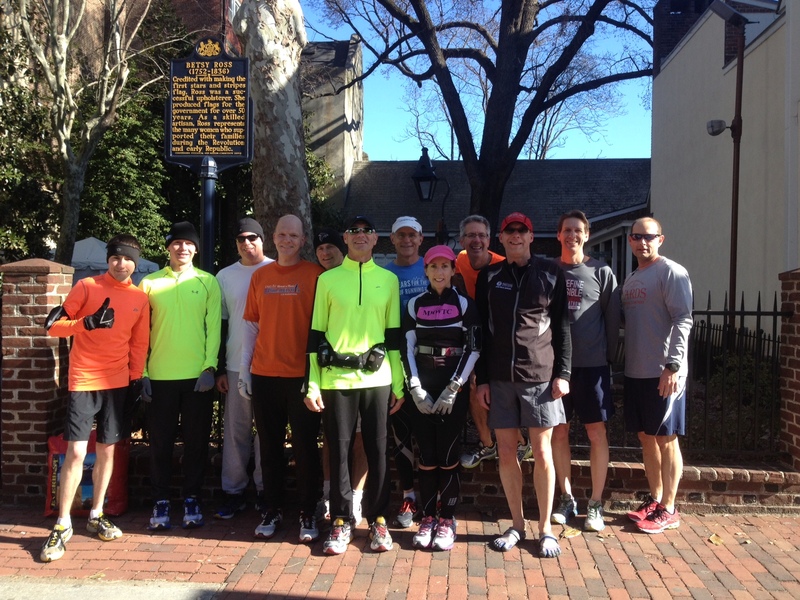 A group from my running club met at the train station for the five AM train into Philly. 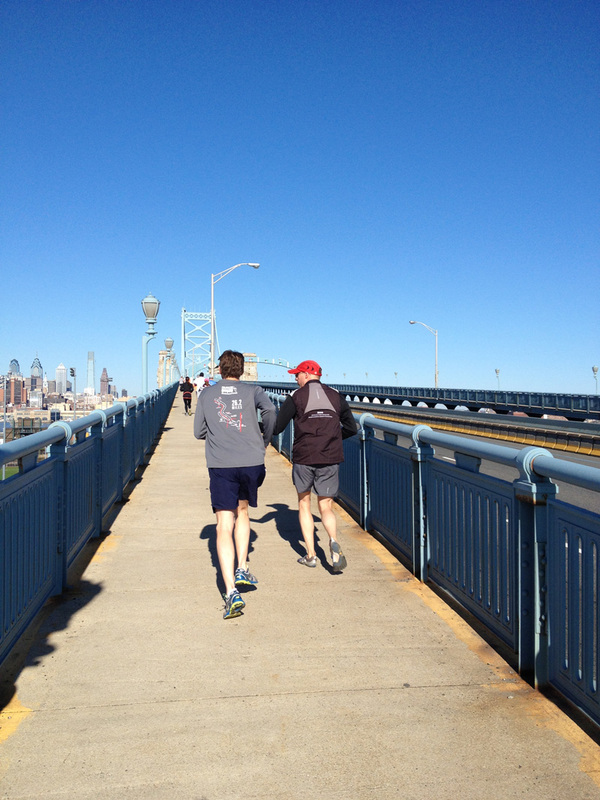 There were plenty of others on the PATCO line from South Jersey heading in for the race. We definitely were a bigger crowd than the normal 5:00 AM Sunday train sees. We rode to the end of the line, 16th and Locust, then started walking to the Ben Franklin Parkway. It is more than a walk. We sped along, the adrenaline pumping up the pace and the chatter. We passed two closed Starbucks, and commented, “we’re up before the baristas.” As we reached the Ben Franklin Parkway, the crowd got thicker. There were entrance gates into the staging area for the runners, but we went through without a holdup. The security guards at the gates seemed to recognize who were runners, and just waved us on through. As we wandered up the parkway we saw the UPS trucks waiting to take our clear plastic personal items bags. We decided whoever makes clear plastic bags for marathons is having a banner year this year. Along a grassy stretch there were dozens of portable toilets with almost no line yet. We all stopped to use the facilities, not because we had to, but because the lines were so short. This is never the case at these big races. We then strolled over to sit at on the steps of the Washington Monument fountain in Eakins Oval. It was still early, about 6 AM, so we had another hour before the start. 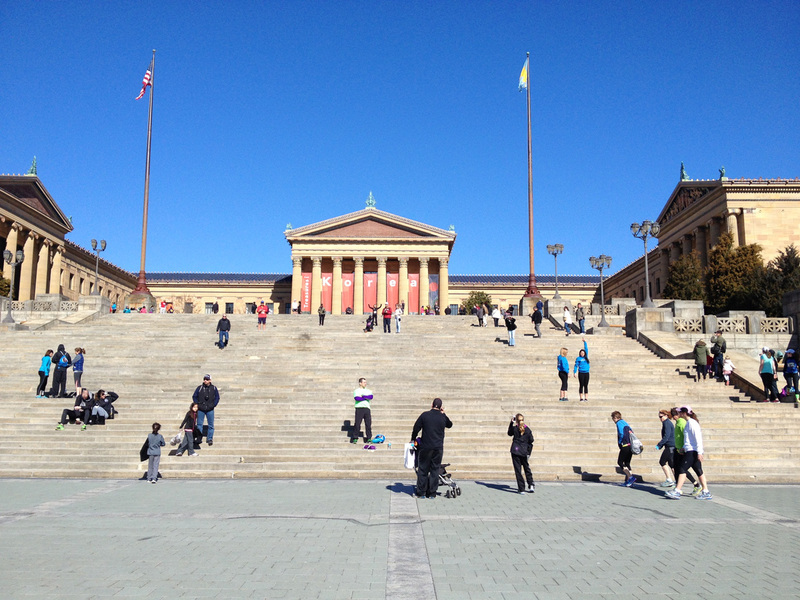 On the steps of the Washington memorial fountain, awaiting the start of the Philly marathon. Photo by B.A. I spoke to a young woman seated on our same steps. She was with her mother and father, who were not running today, but just making sure she was not alone in the crowd. I found out this was her second full marathon, but her father was on his way to running a marathon in all fifty states. That, it would appear, was where the motivation came from for her to run. He had completed about 20 states, and said Alaska was the most interesting so far. The marathon, in Anchorage, is run during the summer solstice in the middle of the night. He’s saving Hawai’i for last. Another trip to the portable toilet was out of the question. The lines had grown tremendously, and the way the toilets were lined up facing each other, the lines melded into a confusing conglomeration. One didn’t know if one was coming or going. 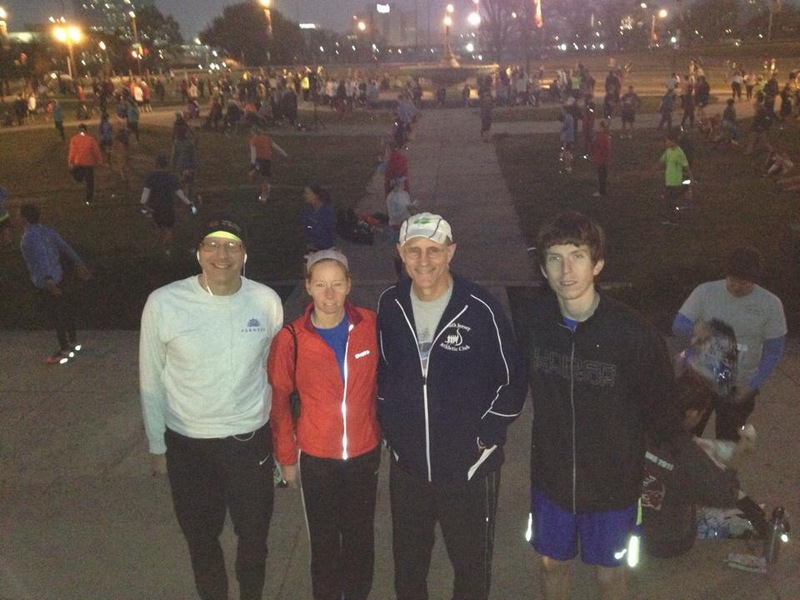 As the start time grew nearer, we headed to the UPS trucks, dropped off our bags, and found our way to the corrals. Unusual for this time of year, the temperature was balmy, in the mid 50’s. I came with a throw-away long sleeve shirt, but decided to pitch it before the race started. We lined up, and then, before you know it, we were off. The course for Philly is a great urban course. It starts down the Ben Franklin Parkway and past our incredibly ornate city hall. The statue on top is known familiarly as Billy Penn, the founder of the city of brotherly love, and as now known also of sisterly affection. Then, it’s down Arch Street, and over to the aptly named Race Street to Columbus Boulevard. The route heads south to Washington Avenue, then in to South Philly. South Philly has a character all its own. In addition to the usual signs held up by fans, I spotted a permanent sign on the street which said, “The last car that parked here still hasn’t been found.” Turning up South Street and heading west, the crowds had grown thick. The nice weather had brought out a great number of spectators, and they were all very noisy and encouraging. Then, its over to Chestnut Street, choked with fans to the point that the course got a little narrow in places. The race was briefly interrupted by a taxi carrying a woman to Pennsylvania Hospital. Over the Schuykill river, the race turns north through the Drexel University area, where celebrating frat boys are banging on pots as the runners go by. Beyond that, the crowds thin considerably as the route heads past the Zoo. Up and around the Belmont Plateau, and the Please Touch museum, the first offering of gels is provided. The sponsor this year was Clif, so we got Clif Shots in all different flavors. The last part of the first half heads down hill to West River Drive, along the Schuykill, then back to the Philadelphia Art Museum. At this point, large signs attempt to direct the half-marathoners one way, and the marathoners the other, for the full trip out to Manayunk. I was feeling pretty decent up to the half, but noticed my nemesis, muscle cramps, starting to threaten. It was certainly early in the race for this to become a factor for me, and I was seriously considering bailing at the half. I would have finished the half in a decent but not earth shaking time. But, my stubborn side would not allow it. This would be my sixth consecutive Philadelphia Marathon, and I did not want to only finish a half, and break my streak. Looking at it from a rational, objective view, who would care? Would stopping at the half make me half a person, unworthy of honor? Regardless of whatever logical argument I could have made, I made the illogical choice to run on. I had arranged with my friend Tony to have a bottle of Gatorade for me at this point. I almost missed him, looking on the wrong side of the street. Fortunately, he was with another of our club members, the delightfully attractive Michele, who I didn’t miss, and I was able to grab my Gatorade and muster on. Around the front of the art museum I went, heading out for the second half, the long slog out to Manayunk and back. I was still going fairly well, with the occasional calf cramp sending one leg or the other out in a bizarre spasm. Another club member had joined me at this point, Dave, running just to support us SJAC club members. He’s a remarkably fast runner, and I felt guilty as I started to fall apart running with him. I also caught up to my teammate Brian, normally much faster than me, who, it appears, was having a worse day than me. 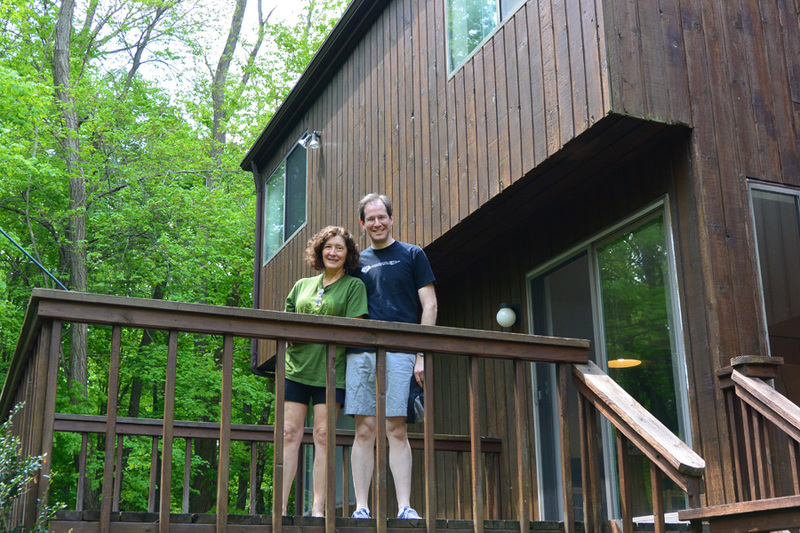 The route goes out along Kelly Drive, past the famous boat house row, and along the Schuykill to the Falls Bridge. This is the only part of the course I really don’t care for. We have to go across the bridge, down a hill along the West river drive for a ways, then make a U-turn to come back up and across the bridge again, for the sole purpose of adding distance. 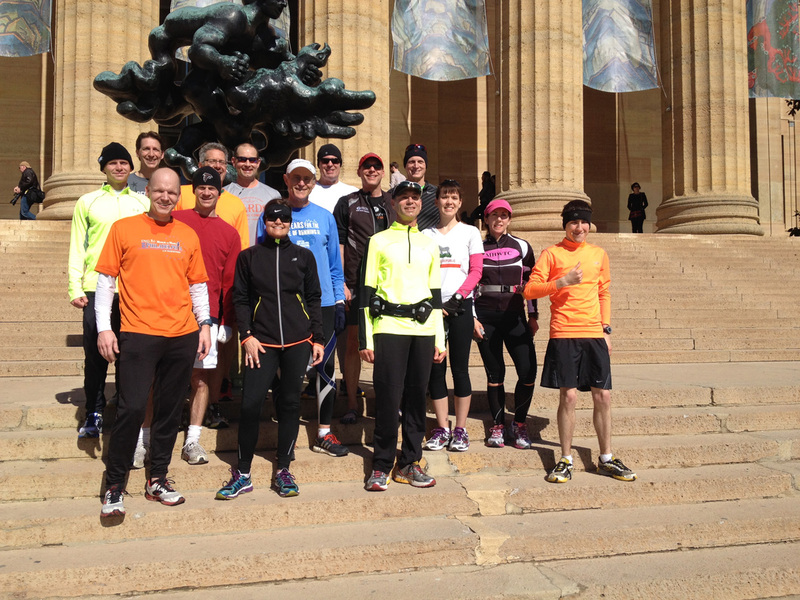 As we got back to the road to Manayunk, I started to have serious problems with the legs. I was having not just cramps, but real pain, and my back, shoulders and arms were cramping up, too. It made for an amusing sidelight. As I grabbed a cup of water from a water stop and raised my arm to drink, my bicep and forearm muscles cramped, and I had to pull my arm down with the other hand to get it to straighten out. By this time, I was already in Manayunk, and the only way back was to go the last six or seven miles, even if I had to walk. Which was what I did. Not the whole way, but a good part of it. My terrific time tumbled, and the walking was all I could muster. I noticed a good number of other runners who had succumbed to fatigue, or the wall, or whatever, and were walking, too. It became a race of walkers. 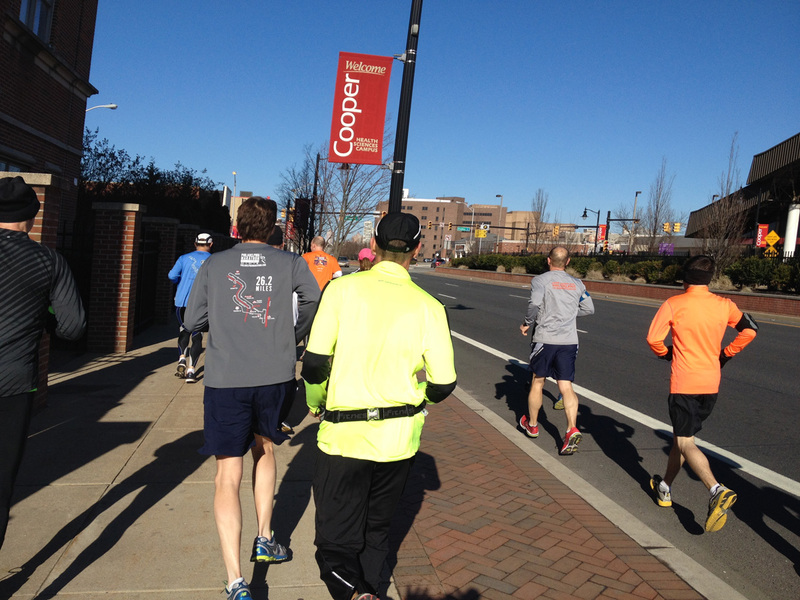 I was jealous of the other runners who continued to zip by me, still able to run and even chat. I stopped several times to stretch, and Dave, my friend from the club, who had lost me for a while, found me again and was very patient and encouraging. Finally, as I neared the boat houses again, I had recovered sufficiently to run again. Interestingly, the pacesetter for the 4:15 group, who had passed me a little earlier, seemed to be having his own troubles, and I passed him as I rounded the curve to the home stretch along the Parkway. I have always said, “look good going out and coming in.” What happens in-between, only I am privy to. So, I looked as good as I could for the finish line. I gave Mayor Nutter a high-five as I crossed the line with the Rocky theme playing loudly over the speakers. The crowds were there and shouting, and the atmosphere, as always at this race, was very upbeat and positive. I sidled along the line of recipients receiving their marathon medals, which this year were beautiful, large gold colored medals for the 20th anniversary of the race. I didn’t need the mylar blanket, because the temperature had risen considerably and it was quite warm. I got in line for my post-race snacks, and headed out to the UPS trucks to pick up my clear plastic clothing bag. Another marathon done, I pondered about the way my muscles had failed me. I was in very decent shape going in to this race, having done a 21 miler two weeks earlier in fine form. It turned out the following day, I had, perhaps, a partial explanation. I developed a fever, sore throat and runny nose, and felt completely washed out. I think I was in the pro-dromal stage of a virus, and that explains the muscle soreness and cramping of everything, not just my legs. I was a real sight the day after the race at work. It is my standard practice to always take the stairs, no elevators for me. As I hobbled in pain on the stairs, particularly going down, sniffling, and moving slowly, my surgical residents were probably wondering why I would do this to myself. I don’t have a ready answer, but I do know that I am already planning next years assault on the marathon circuit. 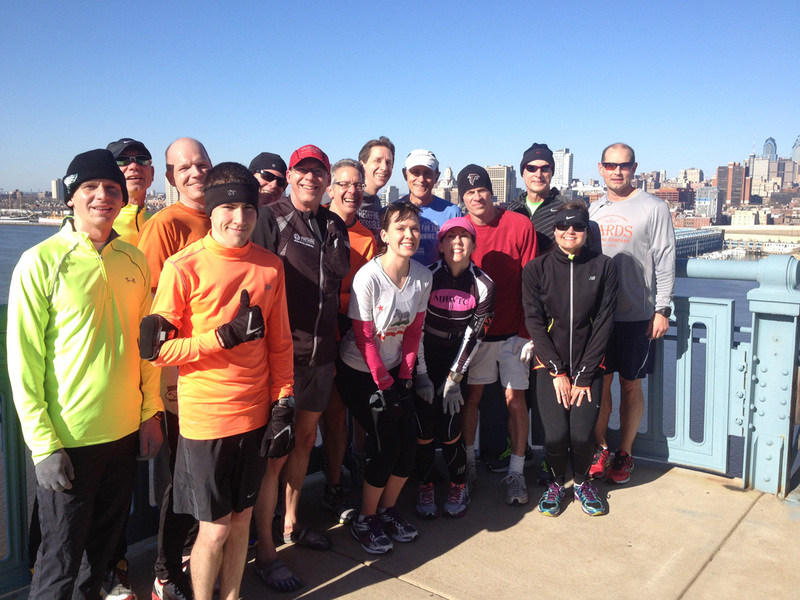 We, my running partners and I, are thinking about Minneapolis/Saint Paul. 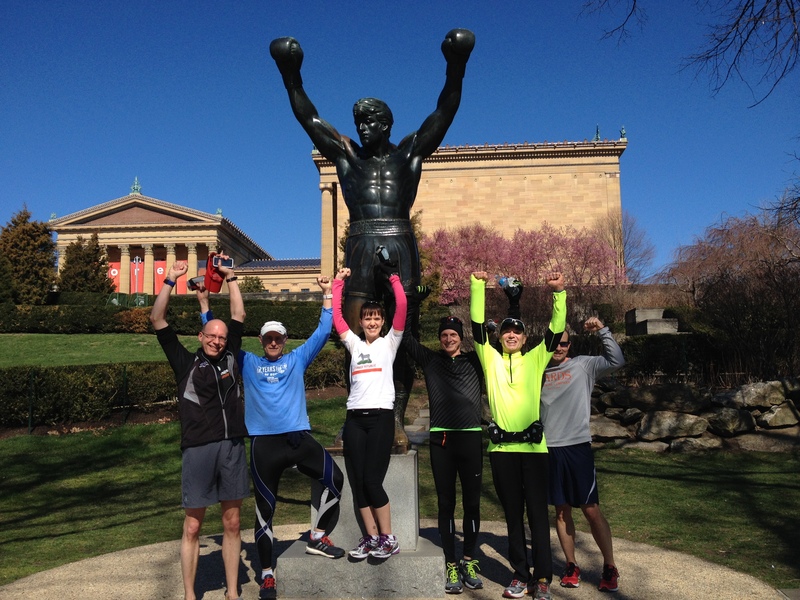 We hear it is a great marathon, and perhaps a little easier course than Philly.